(THUNDER BAY, ON) – In the mid-to-late ‘90s, a young Josh Berube would leave home every morning to deliver the Chronicle Journal with his family dog, Yamaha, by his side. The German Shepherd wasn’t a trained working dog, but every morning it would be at the boy’s side while they marched together along the designated paper route. Two decades later, now a sworn officer for the Thunder Bay Police Service, Cst. Berube is again heading to work with a dog at his side. Cst. 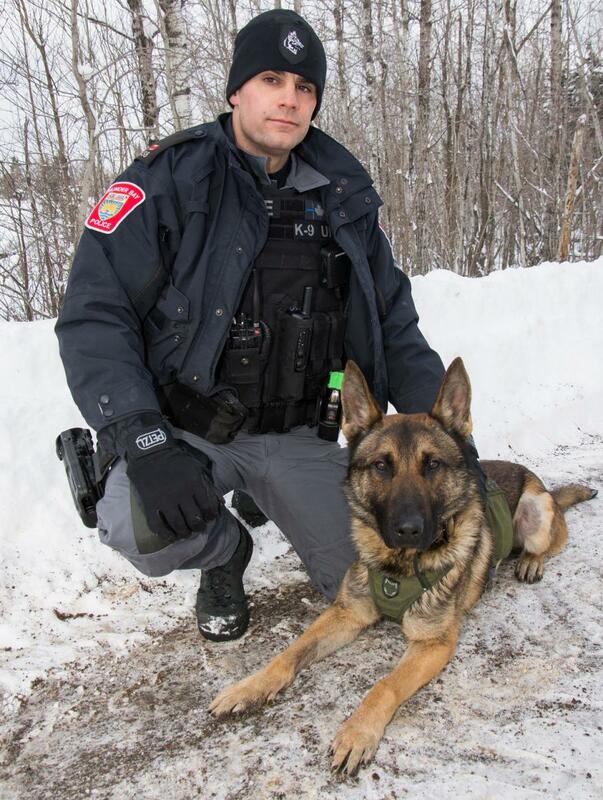 Berube and his partner Lucek officially began working as the Thunder Bay Police Service’s K-9 unit on Jan. 5. The deployment came after 18-weeks of training at the Ontario Police College. The training appears to have paid off, as the newly formed K-9 Unit has already been deployed multiple times and recently assisted in the locating and apprehending of a robbery suspect. “Lucek’s moderately patient given his young age,” Cst. Berube said, of the 20-month old Shepard-Malinois mix. “I think as time goes on we’ll get closer to one another. I think he’s learning a lot about me. The name Lucek was provided by the original breeder in Slovakia, and the name loosely translates from that language to mean light or bringing light. For the Thunder Bay Police Service, Lucek provides a unique skill set that can assist in a variety of incident types. Most notably, Lucek and Cst. Berube will be deployed to search for people, including suspects, persons of interest and missing persons. The unit will also be tasked with article search and making high-risk arrests. Uniform Patrol Insp. Derek West sees the addition of a K-9 unit as an important policing tool for the service. PREVIOUS POST Previous post: DRUG/GUNS BUST: Mother-daughter combo gets nailed by police with three out of town black men. I think that a dedicated man trailing bloodhound would be a great ddition to the TBPS. Not that a multi purpose shepherd/Malinois is not a good thing but when a trail gets old or there are multiple scents and only one that needs to be followed there is no dog breed as proficient as a bloodhound. I would love to see more pieces like this about our brave officers in town. Great job.